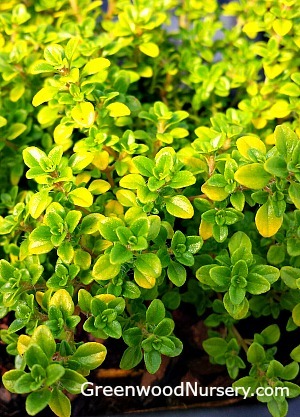 Thyme Archers Gold is a lemon flavored evergreen herb. A must-have for every kitchen and herb garden. Thymus x citriodorus Archers Gold is hardy in zones 6 to 9 and exposes its variegated tiny leaves year round. Use the lemony leaves in marinades, salads, fish dishes, and more. Lavender blooms appear in spring attracting bees and butterflies. Archers Gold Thyme grows 6 to 10 inches tall with a spread up to 12 inches wide. This evergreen creeping thyme is an excellent perennial plant for container gardens, window boxes, kitchen gardens, herb gardens, lawn edgings, butterfly gardens, rock gardens, and even indoor windowsill gardens. Archers Gold Thyme ships in 3.5 inch pots. Orders shipping to CA and AZ addresses will be bare rooted before being prepped for shipping.